This morning I was flipping digitally through the preprints on arXiv, and I stumbled on a rich paper on the evolution of Seyfert’s Sextet. In the paper, they discuss Seyfert’s Sextet as a more evolved version of Stephan’s Quintet. Now, these two compact galaxy groups (CGG) are two of my favorite objects to image, so I couldn’t resist pausing to read the article. But I have to admit that I had to do a bit of googling first. This is because Seyfert’s Sextet doesn’t have 6 member galaxies, and Stephan’s Quintet doesn’t have 5 member galaxies. And while I didn’t remember just how many the two of them had, I knew the answer was attached to the captions of the two pretty pictures above. 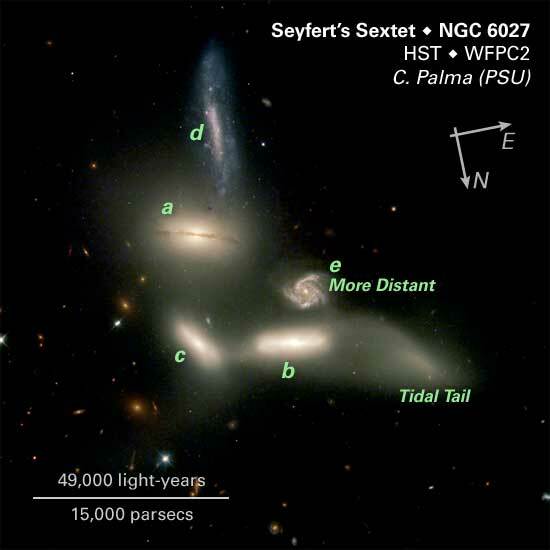 Seyfert’s Sextet has 4 gravitationally bound galaxies, a tidal tail, and one background galaxy. Stephan’s Quintet has 4 gravitationally bound galaxies, and 1 foreground galaxy. So, both clusters have 4 members. So, in this article, they postulate that Seyfert’s Sextet (SS) is 2-3 billion years more evolved than Stephan’s Quintet (SQ). Basically, once your sort out what belongs and what doesn’t, we are looking at a child and a teenager of the same cosmic species. Both systems have 4 galaxies that are interacting, however the galaxies in SS have been more disrupted – they are more shapeless, more of their stars have been stripped into the intergalactic media, and there is that weirdo tidal tail that has been mistaken for a galaxy. These changes are the signs of a few extra galactic eons of evolution. Detailed studies of these two systems allow astronomers to piece together the process of CGG merger. It was initially thought these systems would evolve quickly, with the unstable orbits leading to a mass infall and the formation of isolated “Fossil Elliptical” galaxies. The thing is, no one has found fossil ellipticals even though CGG are very common. This seems to imply they aren’t forming as often as we would expect. One mechanism to explain this slow-down in formation is through dark matter halos. The gravitational pull of dark matter halos can slow mergers and allow a system like SS or SQ to exist for as long as the universe has existed without fully collapsing into a single large galaxy. Today, we believe that these systems slowly grind away on one another, gravitationally rending one another, star by star, as they first transform one another from spiral systems to lenticular (S0) and elliptical systems. 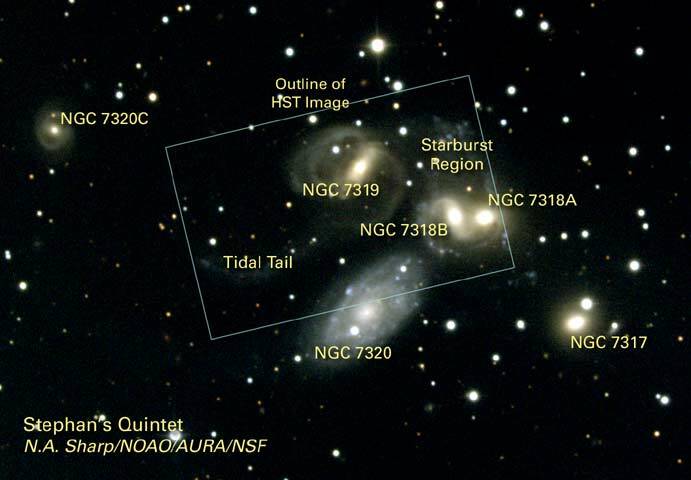 Tidal tails will get teased out of the carnage, and some of the galaxies may even turn on their central supermassive blackholes, glowing as Active Galactic Nuclei during periods of intense star formation. During this process, all the gas in the galaxies will be stripped out, and once the gas is gone, the star formation ends, and we are left with deformed systems orbiting more and more tightly together. Someday, the dead galaxies will merge into a single elliptical system (after perhaps ejecting something), they may eat other galaxies in the process, or gravitationally interact with and spit out other galaxies. But, given enough time, all systems will lead to that single blob in the sky. It’s kind of sad. My favorite objects to image are transitory, and someday, given enough galactic eons, all galaxies groups of this kind will be dead (the universe isn’t exactly still forming groups in large numbers, and what galaxies it is producing are getting more and more scarce ever year). We live in a special (admittedly possibly 10+ billion year long) time that allows us to see small groups, and to see them evolve. But at least what we see, using science, we can understand. This brief little blog entry doesn’t even make a dent in explaining the 70 pages of text, images, tables, graphs and graphics contained in this paper (and I admit freely to only reading the abstract, intro, and discussion in their entireties). If you want to check out this solid piece of science, you can find links here. Thanks Pam for fixing the link. Some of us are very interested in following up on the subjects that you talk about. I spent all day trying to find that paper, but simply could not locate it. Fantastic coincidences have brought you to me. First, a random picture search looking for something not remotely connected to astronomy, gave me the Seyfert’s Sextet. 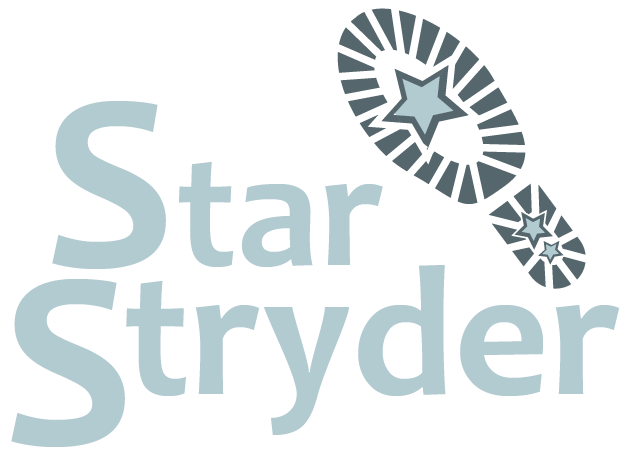 Last night I watched Patrick Moore in the monthly edition of Sky at Night, in which he and some colleagues enlightened us about the collision due to take place between the Milky Way and Andromeda. This morning I awoke thirsty for more knowledge. Your article has only made me more curious. I’ll be back soon. Hey! Quick question that’s completely off topic. Do you know how to make your site mobile friendly? My blog looks weird when viewing from my iphone. I’m trying to find a theme or plugin that might be able to resolve this issue. If you have any recommendations, please share. Appreciate it!